I like talking about Doctor Who! Yes I do! In fact, I was fortunate enough to guest-star on two fantastic podcasts discussing Doctor Who recently! Two True Freaks and Better in the Dark both invited me to discuss my favorite show recently and coincidentally both podcasts were released this week! Here are the details on each podcast. Check them out at the links and take a listen! The very fabric of time and space get stretched to their limits in this epic episode! Chris is joined by Scott “Shag Matthews” Gardner, Hope Mullinax, Mike Poteet and Jose Rivera for a fun filled, informative and PARTY SIZED podcast. It’s a new season with a new Doctor, new companions and new villains as well as some old favorites and not-so-favorites. It’s a show by show roundup of season five filled with music, humor, head-butting and Honeywell’s borderline personality disorder! You might want to kick back, grab some food and a few cold sonic screwdrivers, because this one clocks in at nearly four hours! In Episodes 28 and 31, Tom and Derrick celebrated the anniversary of one of their favorite television series, Doctor Who…since then, enough changes have occurred that The Boys Outta of Brooklyn has enlisted the aid of Views From The Longbox semi-lackey/co-host/Once Upon A Geek typewriter monkey (and perpetual Tom nemesis) Shag to provide an overview of the end of the Tennant era and the inaugural season of the eleventh Doctor, Matt Smith! 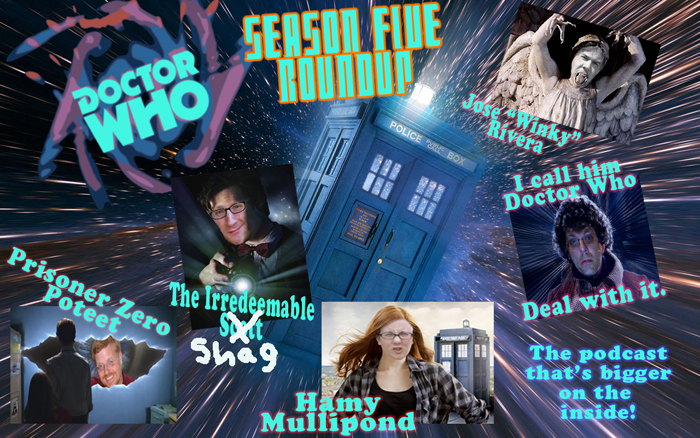 The trio discuss–and sometimes argue over–such subjects as the magnificence of Donna, Rose vs. Amy, the identity of The Dream Lord, the value of Russell T. Davies’ Whedon-ization of the series, the Skittles Daleks and other juicy topics. Plus, what is The Casey Mulligan Road? What is The Caruso Box, and why is Christopher Eccholson stuck in it? What if Brian Cox and Dougray Scott owned a bar together? Podcasts with bowties are cool, so get to clicking! I had a real blast recording each of these. I really appreciate them inviting me to appear on their fantastic shows. After listening, drop either podcaster a line and let them know what you thought of the show. Tell them The Irredeemable Shag sent you!